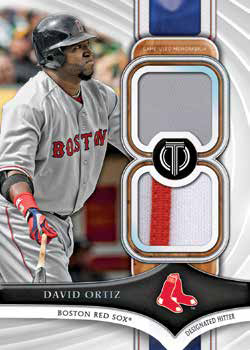 2018 Topps Tribute Baseball ($275 per box) is returning the brand to its place as the first high-end MLB release of the year. And while autographs and memorabilia cards continue to be the staple, there’s more of a themed approach to the inserts this time around. The main configuration of six packs per hobby box, each with either a signed card or relic, doesn’t change, though. Both types of hits are spread evenly with three a piece. Each 2018 Topps Tribute Baseball pack has a pair of base cards. As is tradition with the line, a fair number of retired players are mixed in with the veterans. Parallels, all of which are serial numbered, include Green, Purple, Red (/10) and Black (1/1). Rookies can also be found. These land two per case and have a similar mix of parallels. Tribute Autographs continue to be the lines cornerstone when it comes to signed content. 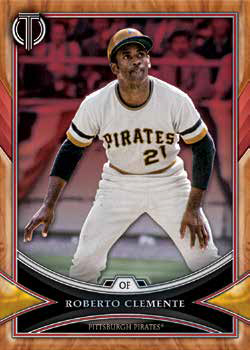 The checklist is similar to the base set in that it highlights both current and retired players. Rookies are also included. All Tribute Autographs are serial numbered including the parallels: Green, Purple (/50), Orange (/25), Red (/10), Printing Plates (1/1) and Black (1/1). Tribute to the Moment Continuity Autographs return for a second year, continuing on from 2017 Topps Tribute Baseball with the same design. These land one per case, at minimum. Generations of Excellence Autographs are also back. Like Tribute to the Moment, these are considered to be a case hit and have a checklist that is limited only to retired stars. 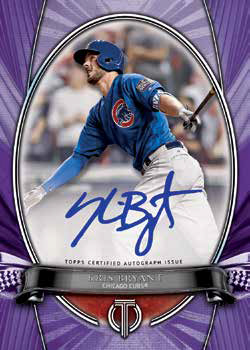 2018 Topps Tribute Baseball has some new autograph inserts set added to the fold. Iconic Perspectives use a layered approach to design. Numbered to 99 or less, all are signed on-card. League Inauguration Autographs are all about rookies with a design that incorporates their MLB debut. Also signed on-card, these are all sequentially numbered. The above autograph inserts have Orange (/25), Red (/10) and Black (1/1) versions to go with the base. Sandy Koufax is the focus of the debuting Tribute Career Achievement Award Autographs. Each is a one-of-one highlighting a different moment or achievement from the legendary pitcher’s career. 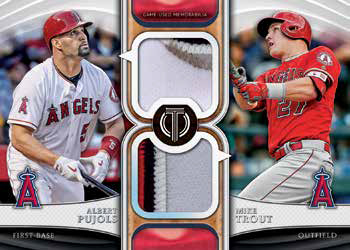 Tribute Tandems book cards pair up players. On the autographed memorabilia side, 2018 Topps Tribute Baseball has Autograph Patch cards. These come with full MLB Authentication that allows collectors to track exactly what game the swatch came from. One-of-one Prime Patch Autograph cards take a similar approach only with a jumbo swatch. Each 2018 Topps Tribute Baseball box has three different types of memorabilia cards. The first is Stamp of Approval. The numbered cards have basic swatches from current players. Dual Relics are guaranteed to have a pair of swatches. On some, they both come from the same player. Others have gear from a pair of players. Triple Relics are the final box guarantee on the memorabilia side coming with three game-used swatches. Parallels for each of the relic inserts include Green, Purple (/50), Orange (/25) and White (1/1).